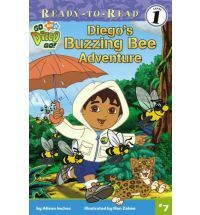 Diego the animal rescuer and his sidekick Baby Jaguar are off to rescue some buzzing bees. They need to find a new place to put their hive before it starts to rain. There is nothing unique about this book. It follows the Diego formula to a T. Diego hears an animal in trouble, used Click the Camera to find them, then helps them out. But that is what is so good about this book. The familiarity helps kids understand the context for reading. There are a variety of words symbolized by small pictures in the text. When you see a picture of three bees, the child is supposed to say the word "buzzing bees" and the parent reads the rest of the sentence. I read this with my son for a couple of years, doing exactly what we were supposed to. It gave him a good grasp of how to read along left to right with the words, and how each word symbolizes something. It also gave him an idea of how to use context to figure out words he doesn't know. Like all of Diego's stories and shows, this is not a true bilingual book, but Spanish is in the book often enough for kids to feel a sense of accomplishment when they memorize these phrases. Yesterday was the first time he read the whole thing on his own though. It was so nice for him to have something so familiar so he could figure out the word from the context even if he couldn't sound it out. I was happy to have a book that featured the letter z so prominently, that's rare! 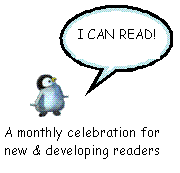 This post is for the I Can Read! Meme, hosted this month by The Family Bookshelf. This is a great way to learn what books to choose for your emerging reader. Take a look at the site and please volunteer to host a month! Then come back June 13-15 when I play host to this great event!